Pakistan has a very tragic history of Military interventions. Four Military dictators have ruled the country for 32 years out of 66 years, since inception of Pakistan. The last military dictator of Pakistan was General Pervez Musharraf. He ruled Pakistan from 1999 till 2008 on gun point. He destroyed Pakistan during his rule, which was the second worst reign in history of Pakistan after general Zia-ul-Haq's Military rule. 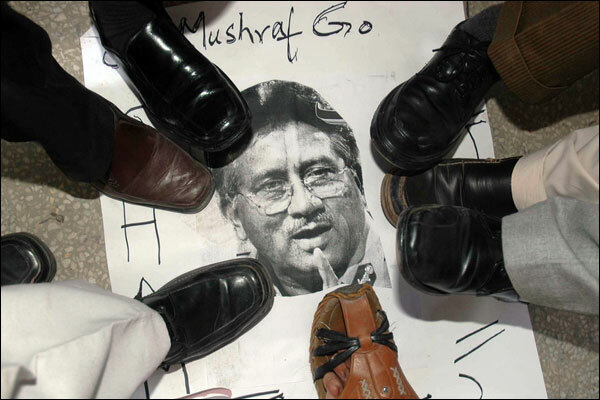 Musharraf is a traitor under constitution of Pakistan and He must be condemned for his crimes. Although, majority of Pakistanis condemn him and remember him as a tyrant but unfortunately there is a minor section of the society which supports him. Yes, that's right there are some people which support dictator/Traitor Musharraf. One can easily say that such people can't be rational, objective, politically conscious and even sane. Pervez Musharraf violated the constitution of Pakistan not once but twice. He once said, in a televised address, that people of Pakistan don't deserve democracy implying that they are not capable of choosing their leaders. He took a U-Turn on Taliban issue after 9/11. Some argue it was inevitable, but Musharraf played a double game. He openly supported America in war against terrorism but covertly supported the Taliban and Militancy in FATA. Thats not all by any means, what he did to the country internally is a totally different story. Nawab Akbar Bugti was assassinated on direct orders of Pervez Musharraf. Due to that Balochistan is still trapped in a swamp of Insurgency. It was Musharraf who started the abduction of political activists and that gave birth to the grave issue of Missing persons which still persists. Musharraf is responsible for the Murder of Benazir Bhutto. Musharraf ordered then Interior Secretary Kamal Shah, Who confessed in court, to provide less security to Musharraf. Moreover, It was Musharraf who staged the Drama of Lal Masjid to divert attention from the Judicial crisis. He then relentlessly massacred countless number of people in Lal Masjid in the name of War against extremism. The entire crimes of Musharraf can't be summed up in one article to say the least. Pervez Musharraf has been charged in Benazir Bhutto Murder case and Lal Masjid case. Akbar Bugti Assassination case and Judges detention case is being heard against him. Prime Minister Nawaz Sharif has announced to initiate proceedings of Treason against him. The treatment that He is getting from the courts is completely justified. Pervez Musharraf is a proven wrongdoer and he has destroyed Pakistan. Still if anyone supports him then He can be one of the following. Either He is working for Musharraf's tiny political party i.e. All Pakistan Muslim League or his mental faculties have given up working and therefore that person should be in a lunatic asylum. The reason for such a harsh attitude towards Musharraf's supporters is that they are supporting a killer, a traitor and surely an enemy of Pakistan in the guise of its protector. Supporting Musharraf is like rubbing Salt to the wounds of all those who lost their loved ones due to the ill-conceived policies and actions of the Musharraf. Any person who believes in rationality, logic and a civilized mind can't even imagine supporting dictator Musharraf. Ignorant supporters Musharraf present some arguments in defence of their leader which are nothing but Myths. First myth is that Musharraf brought Pakistan on a track of Economic development and If he had remained in Power Pakistan would have developed further. This is a blatant lie, During Musharraf's time there was huge inflow of Foreign aid due to Musharraf's decision to throw Pakistan in American camp. These Surplus Foreign Funds helped in making the economic indicators better in short term but there was no real development. There was no change in the lives of people for that matter. Musharraf's Finance Minister and Then Prime Minister, Shaukat Aziz, put Pakistan on a track of credit driven economy very hastily. This policy backfired and resulted in increase in debts both internally and externally which devalued the currency, so on and So forth. Second myth is that Musharraf was fighting terrorism very effectively and successive governments have failed in controlling terrorism. Fact of the matter is that It was Musharraf who created the problem of terrorism in Pakistan in the first place. He covertly supported militancy in FATA and created a brand of terrorists which later on revolted and took the shape of Pakistani Taliban. It was Musharraf who give Taliban breathing space in Swat and didn't carry out any operation against them when they could be controlled. Supporters of Musharraf have already discarded rationality and therefore its futile to argue with them based on logic and facts. They keep on praising and defending their leader irrespective of what's the reality. Such people are actually black sheep who brought a bad name to entire Pakistani political society. If a foreigner comes to know that there are such people in Pakistan who still support Musharraf after what he did to the country, He/She simply can't believe it. Irony of the matter is that supporters of dictator Musharraf allege that current rulers are a threat to Pakistan, like Musharraf never was and He did nothing which was damaging to the country. What I can say to such people is that you are helpless and I like most of politically conscious and rational citizens of this country have given up making you understand something which you people can't simply understand. Therefore, Keep on supporting him and keep on living in a fool's paradise that He will return one day to lead Pakistan, Once again.